The Mr. George Gold Coin award series has been a staple on our blog for more than a year. We’re starting the new year off right with a story about our two most recent award recipients. The Mr. George Gold Coin award is given to associates who go above and beyond for our customers and fellow associates. Our latest recipients are Carlos Martinez and Michael La Gare. Michael is a Produce Manager at Store 1320 in Seminole, Florida. 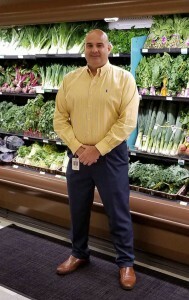 Carlos Martinez is a Produce Buyer who works in our Corporate offices in Lakeland, Florida. These two associates collaborated to ensure our customers were provided premier service. Read the story below. Kevin was recently diagnosed with leukemia. His favorite food is cotton candy grapes. Kevin’s significant other, Kimberly, called her local Publix and spoke with Produce Manager Michael La Gare. He informed her that crops were in short supply this past season and they were currently out of stock without a date set for their next delivery. Kimberly asked Michael if he could try to find a package of the grapes anywhere nearby that she could purchase. After offering his sympathy to Kimberly, Michael began working to find these grapes for Kevin. Within a few minutes, Kimberly received a phone call from Carlos Martinez. Carlos is a Buyer in our Corporate Produce department. Carlos explained to Kimberly that due to the limited crop this year, no stores in the immediate area had the grapes in stock. Feeling disheartened, she thanked Carlos for letting her know the status… but Carlos wasn’t finished. He called the grower The Grapery directly. Carlos asked the owner if he could scour the perimeter of the vineyards to get enough product to send a case overnight directly to the customer. Carlos continued to follow up until the package was ready to be sent. 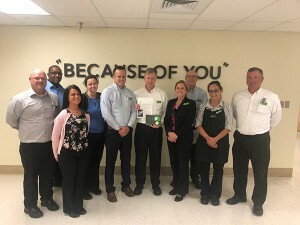 Have you ever witnessed an associate going above and beyond at your local Publix? Share your story with us on Facebook or Twitter, via our Contact Us page or by phone at (800) 242-1227. To read the stories of other recipients of the Mr. George Gold Coin, check them out here.